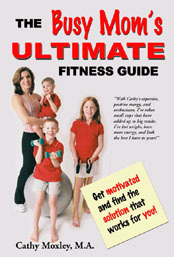 Cathy Moxley has been helping people get fit, lose weight, and stay motivated since 1987. She specializes in helping people make sense of the endless health information out there, put together a plan that will work, and find that part within them that will keep it going! She focuses on teaching practical fitness, nutrition, and wellness information that is easy to understand and apply to your busy daily life. She is dedicated to helping you achieve your own unique health and fitness goals.